Retin-A® and glycolic acid derivatives can be applied to the hands topically. This process causes “age” spots to fade and tissue appears less transparent. Laser treatments can remove 90-95% of age spots most effectively. Chemical peels and microdermabrasion are other options. Unsightly veins on the hands may be treated with lasers or by conventional sclerotherapy. Natural or synthetic soft tissue fillers can be used to pump up the skin, giving it a more youthful appearance. Combinations of these treatments can be used to rid the hands of a skeletal look and reverse the signs of aging. CO2 and Erbium laser skin rejuvenation gives your doctor precise control as the procedure gently removes the damaged skin or “age” spots to reveal smooth, fresher-looking hands. Spots are removed in a precise, rapid, bloodless fashion achieving excellent results. 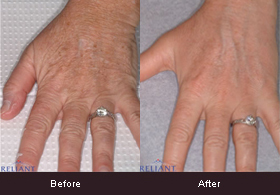 Laser hand rejuvenation can be performed with local anesthesia. The duration of the improvement depends on the size and location of area treated, as well as on the material used.